Vocabulary Learning Strategies and Concepts :: Read Naturally, Inc. According to Steven Stahl (2005), “Vocabulary knowledge is knowledge; the knowledge of a word not only implies a definition, but also implies how that word fits into the world.” We continue to develop vocabulary throughout our lives. Words are powerful. Words open up possibilities, and of course, that’s what we want for all of our students. We know that young children acquire vocabulary indirectly, first by listening when others speak or read to them, and then by using words to talk to others. As children begin to read and write, they acquire more words through understanding what they are reading and then incorporate those words into their speaking and writing. Vocabulary knowledge varies greatly among learners. The word knowledge gap between groups of children begins before they enter school. Why do some students have a richer, fuller vocabulary than some of their classmates? Why do some students have a limited, inadequate vocabulary compared to most of their classmates? Children who have been encouraged by their parents to ask questions and to learn about things and ideas come to school with oral vocabularies many times larger than children from disadvantaged homes. Without intervention this gap grows ever larger as students proceed through school (Hart and Risley, 1995). From the research, we know that vocabulary supports reading development and increases comprehension. Students with low vocabulary scores tend to have low comprehension and students with satisfactory or high vocabulary scores tend to have satisfactory or high comprehension scores. The report of the National Reading Panel states that the complex process of comprehension is critical to the development of children’s reading skills and cannot be understood without a clear understanding of the role that vocabulary development and instruction play in understanding what is read (NRP, 2000). Chall’s classic 1990 study showed that students with low vocabulary development were able to maintain their overall reading test scores at expected levels through grade four, but their mean scores for word recognition and word meaning began to slip as words became more abstract, technical, and literary. Declines in word recognition and word meaning continued, and by grade seven, word meaning scores had fallen to almost three years below grade level, and mean reading comprehension was almost a year below. Jeanne Chall coined the term “the fourth-grade slump” to describe this pattern in developing readers (Chall, Jacobs, and Baldwin, 1990). How do we close the gap for students who have limited or inadequate vocabularies? The National Reading Panel (2000) concluded that there is no single research-based method for developing vocabulary and closing the gap. From its analysis, the panel recommended using a variety of indirect (incidental) and direct (intentional) methods of vocabulary instruction. Most students acquire vocabulary incidentally through indirect exposure to words at home and at school—by listening and talking, by listening to books read aloud to them, and by reading widely on their own. The amount of reading is important to long-term vocabulary development (Cunningham and Stanovich, 1998). Extensive reading provides students with repeated or multiple exposures to words and is also one of the means by which students see vocabulary in rich contexts (Kamil and Hiebert, 2005). Teaching specific words (rich, robust instruction) to support understanding of texts containing those words. Teaching word-learning strategies that students can use independently. Promoting the development of word consciousness and using word play activities to motivate and engage students in learning new words. Students need a wide range of independent word-learning strategies. Vocabulary instruction should aim to engage students in actively thinking about word meanings, the relationships among words, and how we can use words in different situations. This type of rich, deep instruction is most likely to influence comprehension (Graves, 2006; McKeown and Beck, 2004). Characterize the word and how it is typically used. Explain the meaning using everyday language—language that is accessible and meaningful to the student. Sometimes a word’s natural context (in text or literature) is not informative or helpful for deriving word meanings (Beck et al., 2013). It is useful to intentionally create and develop instructional contexts that provide strong clues to a word’s meaning. These are usually created by teachers, but they can sometimes be found in commercial reading programs. Research shows that when words and easy-to-understand explanations are introduced in context, knowledge of those words increases (Biemiller and Boote, 2006) and word meanings are better learned (Stahl and Fairbanks, 1986). When an unfamiliar word is likely to affect comprehension, the most effective time to introduce the word’s meaning may be at the moment the word is met in the text. Research by Nagy and Scott (2000) showed that students use contextual analysis to infer the meaning of a word by looking closely at surrounding text. Since students encounter such an enormous number of words as they read, some researchers believe that even a small improvement in the ability to use context clues has the potential to produce substantial, long-term vocabulary growth (Nagy, Herman, and Anderson, 1985; Nagy, Anderson, and Herman, 1987; Swanborn and de Glopper, 1999). 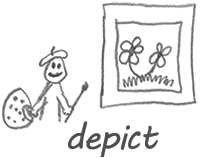 For many students, it is easier to remember a word’s meaning by making a quick sketch that connects the word to something personally meaningful to the student. The student applies each target word to a new, familiar context. The student does not have to spend a lot of time making a great drawing. The important thing is that the sketch makes sense and helps the student connect with the meaning of the word. Applying the target words provides another context for learning word meanings. When students are challenged to apply the target words to their own experiences, they have another opportunity to understand the meaning of each word at a personal level. This allows for deep processing of the meaning of each word. The ability to analyze word parts also helps when students are faced with unknown vocabulary. If students know the meanings of root words and affixes, they are more likely to understand a word containing these word parts. Explicit instruction in word parts includes teaching meanings of word parts and disassembling and reassembling words to derive meaning (Baumann et al., 2002; Baumann, Edwards, Boland, Olejnik, and Kame'enui, 2003; Graves, 2004). Semantic maps help students develop connections among words and increase learning of vocabulary words (Baumann et al., 2003; Heimlich and Pittleman, 1986). 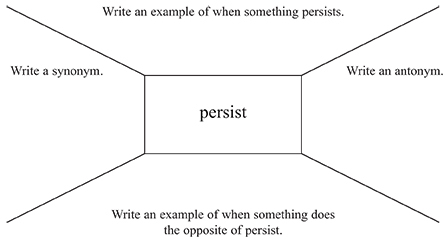 For example, by writing an example, a non-example, a synonym, and an antonym, students must deeply process the word persist. Word consciousness is an interest in and awareness of words (Anderson and Nagy, 1992; Graves and Watts-Taffe, 2002). Students who are word conscious are aware of the words around them—those they read and hear and those they write and speak (Graves and Watts-Taffe, 2002). Word-conscious students use words skillfully. They are aware of the subtleties of word meaning. They are curious about language, and they enjoy playing with words and investigating the origins and histories of words. Teachers need to take word-consciousness into account throughout their instructional day—not just during vocabulary lessons (Scott and Nagy, 2004). It is important to build a classroom “rich in words” (Beck et al., 2002). Students should have access to resources such as dictionaries, thesauruses, word walls, crossword puzzles, Scrabble® and other word games, literature, poetry books, joke books, and word-play activities. Language categories: Students learn to make finer distinctions in their word choices if they understand the relationships among words, such as synonyms, antonyms, and homographs. Figurative language: The ability to deal with figures of speech is also a part of word-consciousness (Scott and Nagy 2004). The most common figures of speech are similes, metaphors, and idioms. Once language categories and figurative language have been taught, students should be encouraged to watch for examples of these in all content areas. The individualized format provides differentiated instruction for students working independently. The group format is designed for small group instruction—up to six students. Each Take Aim level teaches 288 carefully selected target words in the context of engaging, non-fiction stories. The target words are systematically taught using the research-based strategies described above. The intensive and focused lesson design helps students learn the target words and internalize the skills and strategies necessary for independently learning unknown words. Read Naturally also offers a Splat-O-Nym app for iPad that teaches vocabulary using game-based technology. Splat-O-Nym quizzes students with synonym questions, antonym questions, and meaning-from-context questions and awards points for correct answers. Cloud-based software that develops fluency and phonics and also provides support for vocabulary with audio-supported definitions of key words. A print-based program with audio support on CDs that develops fluency and phonics and also supports vocabulary development with glossaries of key words. Teacher-led program for teaching small groups of beginning readers the foundational skills of phonemic awareness, phonics, and fluency with some vocabulary support. A guided reading app that develops readers’ fluency and provides vocabulary support with audio-supported definitions of key words. Printed books with audio support on CDs that develop readers fluency and support vocabulary development with glossaries of key words. Anderson, R. C., & Nagy, W. E. (1992). “The vocabulary conundrum,” American Educator, Vol. 16, pp. 14-18, 44-47. Baumann, J. F., Edwards, E. C., Font, G., Tereshinski, C. A., Kame'enui, E. J., & Olejnik, S. (2002). “Teaching morphemic and contextual analysis to fifth-grade students.” Reading Research Quarterly, Vol. 37, pp. 150–176. Baumann, J. F., Kame'enui, E. J., & Ash, G. E. (2003). “Research on vocabulary instruction: Voltaire redux,” in J. Flood, D. Lapp, J. R. Squire, and J. M. Jensen (eds. ), Handbook of research on teaching the English language arts, 2nd ed., Mahwah, NJ: Erlbaum, pp. 752–785. Beck, I. L., McKeown, M. G., & Kucan, L. (2002). Bringing words to life. Robust vocabulary instruction, New York: Guilford Press. Beck, I. L., McKeown, M. G., & Kucan, L. (2013). Bringing words to life. Robust vocabulary instruction, 2nd ed., New York: Guilford Press. Biemiller, A. & Boote, C. (2006). “An effective method for building meaning vocabulary in the primary grades,” Journal of Educational Psychology, Vol. 98, No. 1, pp. 44–62. Chall, J. S., Jacobs, V. A., & Baldwin, L. E. (1990). The reading crisis: Why poor children fall behind, Cambridge, MA: Harvard University Press. Cunningham, A. E. & Stanovich, K. E. (1998). “What reading does for the mind,” American Educator, Vol. 22, pp. 8–15. Graves, M. F. (2004). “Teaching prefixes: As good as it gets?,” in J. Baumann & E. Kame'enui (eds. ), Vocabulary instruction, research to practice, New York: Guilford Press, pp. 81–99. Graves, M. F. (2006). The vocabulary book, New York: Teachers College Press, International Reading Association, National Council of Teachers of English. Graves, M. F. & Watts-Taffe, S. M. (2002). “The place of word consciousness in a research-based vocabulary program,” in A. E. Farstrup and S. J. Samuels (eds. ), What research has to say about reading instruction, Newark, DE: International Reading Association. Hart, B. & Risley, T. R. (1995). Meaningful differences in the everyday experience of young American children, Baltimore, MD: Paul H. Brookes. Heimlich, J. E. & Pittleman, S. D. (1986). Semantic mapping: Classroom applications, Newark, DE: International Reading Association. Kamil, M. L. & Hiebert, E. H. (2005). “Teaching and learning vocabulary: Perspectives and persistent issues,” in E. H. Hiebert and M. L. Kamil (eds. ), Teaching and learning vocabulary: Bringing research to practice, Mahwah, NJ: Erlbaum. McKeown, M. G. & Beck, I. L. (2004). “Direct and rich vocabulary instruction,” in J. Baumann & E. Kame'enui (eds. ), Vocabulary instruction, research to practice, New York: Guilford Press, pp. 13–27. Nagy, W. E., Anderson, R. C., & Herman, P. A. (1987). “Learning word meanings from context during normal reading,” American Educational Research Journal, Vol. 24, pp. 237-270. Nagy, W. E., Herman, P. A. & Anderson, R. C. (1985). “Learning words from context,” Reading Research Quarterly, Vol. 20, No. 2, pp. 233–253. Nagy, W. E. & Scott, J. A. (2000). “Vocabulary processes,” in M. L. Kamil, P. Mosenthal, P. D. Pearson, and R. Barr (eds. ), Handbook of reading research, Vol. 3, Mahwah, NJ: Erlbaum. National Reading Panel. (2000). Teaching children to read: An evidence-based assessment of the scientific research literature on reading and its implications for reading instruction (NIH Publication No. 00-4769), Washington, DC: U.S. Government Printing Office, pp. 13–14. Scott, J. & Nagy, W. (2004). “Developing word consciousness,” in J. Baumann & E. Kame'enui (eds. ), Vocabulary instruction, research to practice, New York: Guilford Press, pp. 201–215. Stahl, S. A. (2005). “Four problems with teaching word meanings (and what to do to make vocabulary an integral part of instruction),” in E. H. Hiebert and M. L. Kamil (eds. ), Teaching and learning vocabulary: Bringing research to practice, Mahwah, NJ: Erlbaum. Stahl, S. A. & Fairbanks, M. M. (1986). “The effects of vocabulary instruction: A model-based meta analysis,” Review of Educational Research, Vol. 56, pp. 72–110. Swanborn, M. S. & de Glopper, K. (1999). “Incidental word learning while reading: A meta-analysis,” Review of Educational Research, Vol. 69, pp. 261-285.